Vaud is a canton of Switzerland. 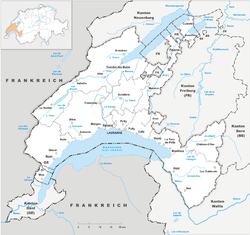 It borders the cantons of Geneva, Neuchâtel, Fribourg, Berne and Valais (west to east). The capital city is Lausanne. About 790,000 people live in the canton. Of these, about 138,000 live in Lausanne. About 82% of the population speak French as their first language. This page was last changed on 25 January 2019, at 01:11.